Holy Equal-to-the-Apostles Nikolai, ArchBishop, Apostle to Japan, – in the world Ivan Dimitrievich Kasatkin, was born on 1 August 1836 in the village of Berezovsk, Bel'sk district, Smolensk diocese, where his father served as deacon. At the age of five he lost his mother. Having completed the Bel'sk religious school, and afterwards the Smolensk religious seminary, in 1857 Ivan Kasatkin entered the Saint-Peterburg spiritual academy. On 24 June 1860, in the academy temple of the Twelve Apostles, bishop Nektarii gave him monastic vows with the chosen name Nikolai. On the day of memory of the first-ranked Apostles Peter and Paul, 29 June, the monk Nikolai was ordained deacon, and on 30 June – the altar-feastday of the academy temple – to the dignity of priestmonk. Afterwards through his wish Father Nikolai was assigned to Japan, as head of the consular church in the city of Khakodate. The preaching of the Gospel in Japan at first seemed completely impossible. In Father Nikolai's own words: "the Japanese of that time looked upon foreigners as beasts, and on Christianity as a villainous church, to which it was possible only for total knaves and charlatans to belong". Eight years passed in this way, in studying the country, the people, their language and manners and customs, amidst which he would have to preach. Up until 1868 the flock of Father Nikolai still numbered about twelve Japanese. At the end of 1869 priestmonk Nikolai made a report to the Synod in Peterburg about the result of his work. This resolution was adopted: "to form for the preaching of the Word of God among the pagan Japanese a special Russian Spiritual Mission". Father Nikolai was elevated to the dignity of archimandrite and assigned as head of this Mission. Having returned to Japan, he transferred the Khakodate flock to priestmonk Anatolii, and himself shifted the centre of the Mission to Tokyo. In 1871 there began in the country a persecution of christians; many were subjected to being chased about (among this number was the first Japanese Orthodox person, the afterwards reknown missionary priest Paul Savabe). Only in the year 1873 did the persecution abate somewhat, and it became possible to freely preach Christianity. In this year archimandrite Nikolai set about the construction in Tokyo of a church and school for fifty men, and later also a religious school, which in 1878 was transformed into a seminary. In 1874 there arrived at Tokyo His Grace Paul, Bishop of Kamchatka, to ordain to the priestly dignity candidates from the local population recommended by archimandrite Nikolai. During this time at the Mission in Tokyo there operated four schools – catechetical, seminary, women's, church readers. And in Khakodate there were two schools: boys and girls. In the second half of 1877 the Mission began regularly to publish the journal "Church Messenger". By the year 1878 there already numbered in Japan 4115 Christians, and there existed a number of christian communities. Divine-services and teaching in the native language, the publication of books of religio-moral content – these were the means which permitted the Mission to attain in a short while such reknown results. Archimandrite Nikolai was ordained bishop on 30 March 1880 in the Trinity Cathedral of Alexander Nevsky Lavra. Returning to Japan, he began with still greater fervour to continue his apostolic work: he completed construction on the Cathedral of the Resurrection of Christ in Tokyo, he set about the translation of the Divine-service books, and he composed into the Japanese language a special Orthodox theological dictionary. Great hardship befell the lot of the saint and his flock at the time of the Russo-Japanese War. For his ascetic labour during these difficult years he was deemed worthy of elevation to the dignity of archbishop. In the year 1911 half a century had passed from the time, when the young priestmonk Nikolai had first tread on Japanese soil. But by this time in 266 communities of the Japanese Orthodox Church there were 33017 Christians, 1 archbishop, 1 bishop, 35 priests, 6 deacons, 14 teachers of singing, and 116 preacher-catechists. In his 76th year on 3 February 1912, the Enlightener of Japan ArchBishop Nikolai expired peacefully to the Lord. 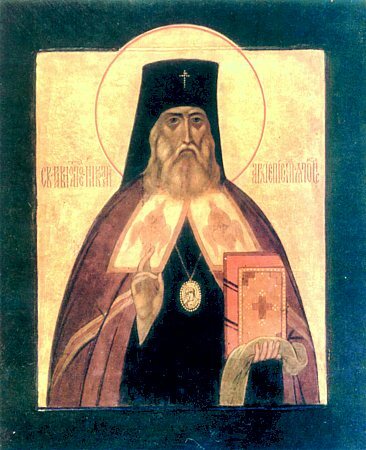 The Holy Synod of the Russian Orthodox Church passed resolution on 10 April 1970 concerning the glorification of the Sainted-Bishop into the ranks of the "RavnoApostoli" "Equal-to-the-Apostles", since in Japan the saint was long honoured as a great righteous one and prayerful intercessor before the Lord.